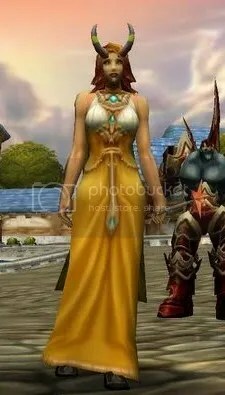 I was wondering today about the people that design gear for WOW. What are they thinking sometimes when they come up with these outfits? 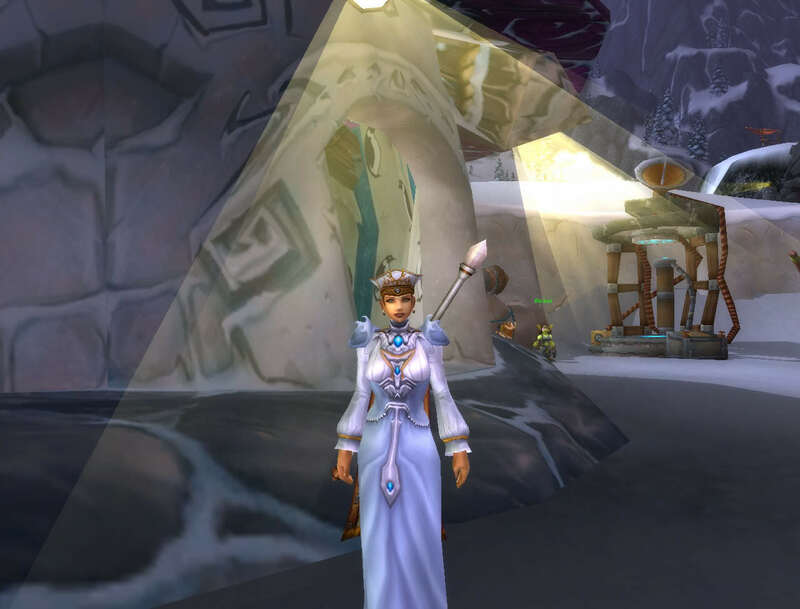 Kate Hudson is wearing a white dress that kind of resembles the Elegant Robes, one of my favorite robes in-game. 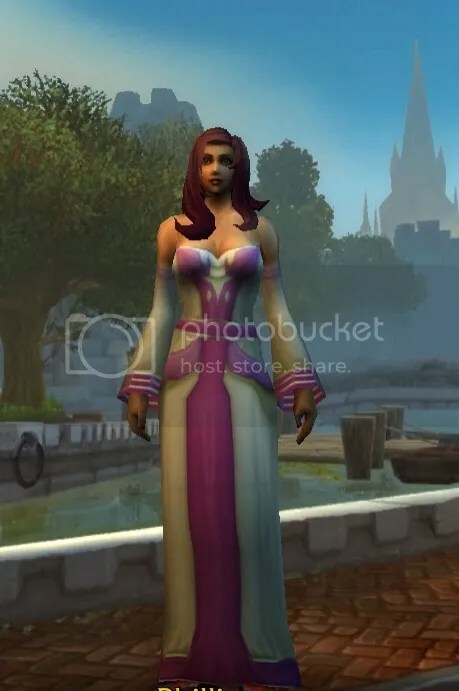 Hudson’s dress is also similar in color and style to Mooncloth Robe, which I wore with a white shirt for a guild winter party. In this photo of Taylor Swift, she is wearing an extremely low-cut gown. 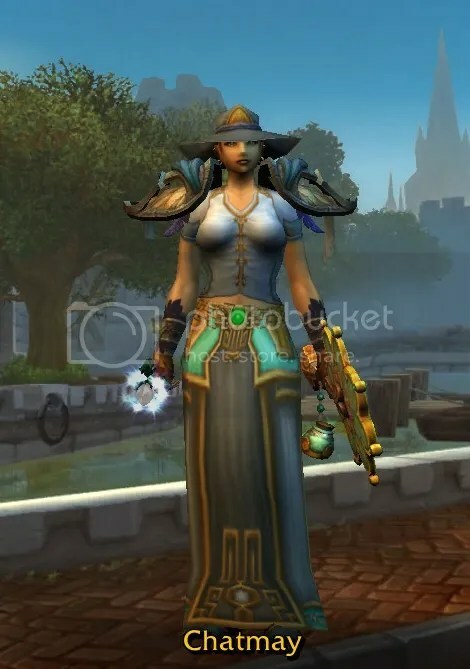 You can get this cloth look in-game with several robes, although I found two of mine seemed lower-cut than the others. 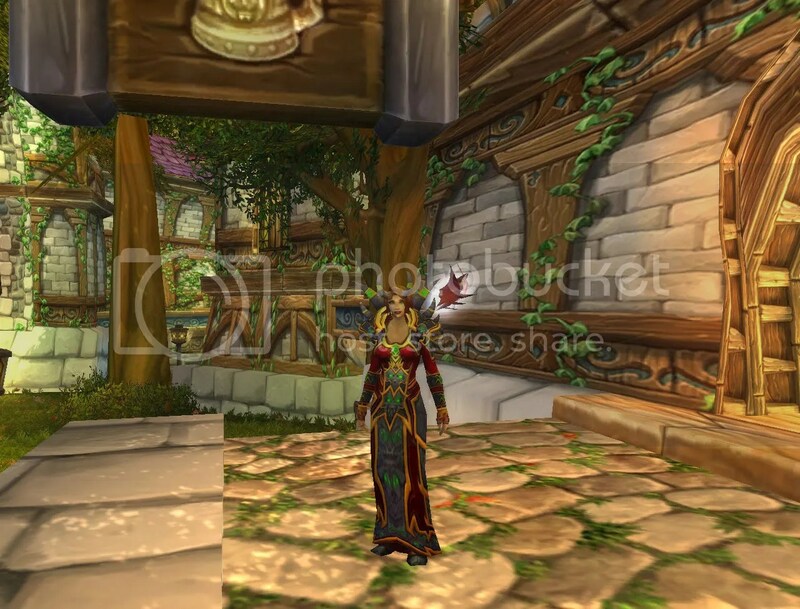 Another low-cut option is Cataclysmic Gladiator’s Felweave Raiment, a pretty awesome robe from level 85 PVP. With another scary helm…. 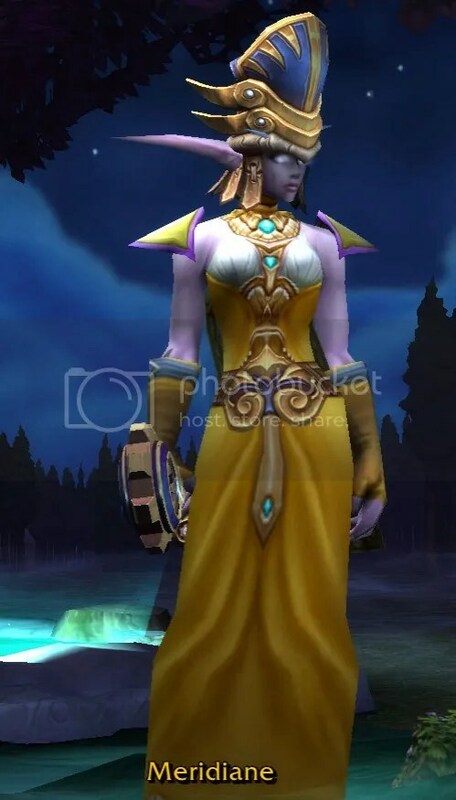 Finally, I’m not sure who this celebrity is, but she is wearing an off-the-shoulder dress that to me looks like Astralaan Robe, which my mage and my paladin (as RP gear) have both worn. Do you think these are good knock-offs? What did I miss? Stay tuned for more upcoming celebrity-WOW fashion posts! The title to this post sounds so dramatic, so not sure if this will be a let-down or not. 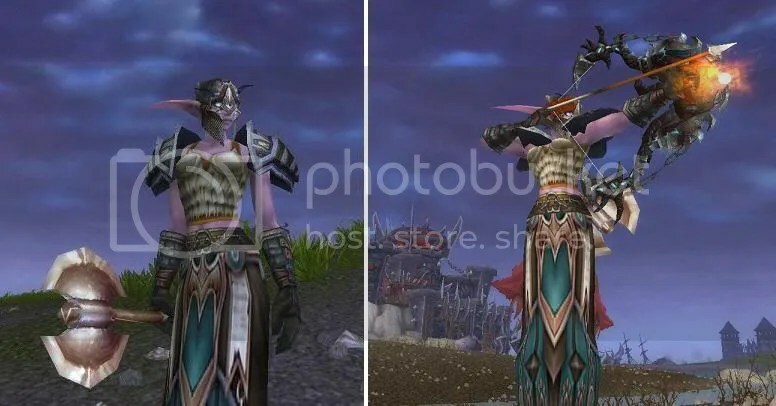 I was going to shoot some level 90 PVP shots of Chatmay for my “Farewell to WOW” video (those shots never actually made it to the video, but that will be covered in another post), so I had to transmog my gear that I had used previously of course. I decided to make an outfit around Pontifex Kilt (leg slot). 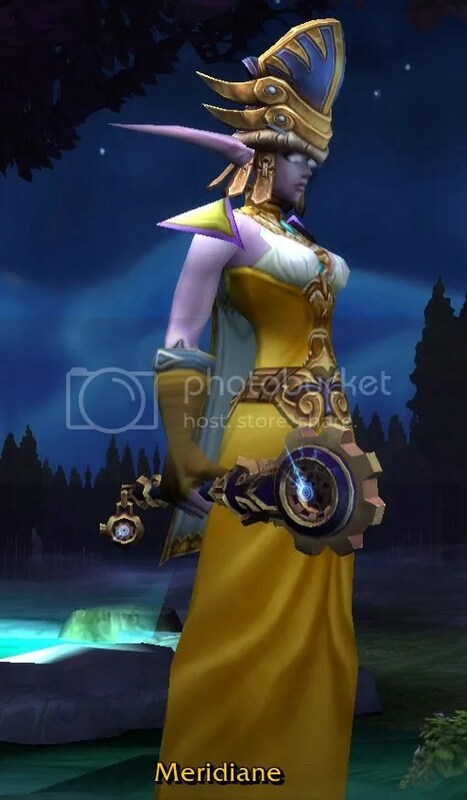 I threw these pieces together, and at the last minute I threw in Mayor’s Hand Fan (offhand), which was a grossly huge piece I had kept from Pandaria questing for some reason. This pic isn’t a very good shot of it, but this has to be the only outfit it ever suited. Not too happy with this wand I used, but I didn’t have time at the moment to go digging for a different one that matched. The results of Transmogolympics are flying in very quickly lately. 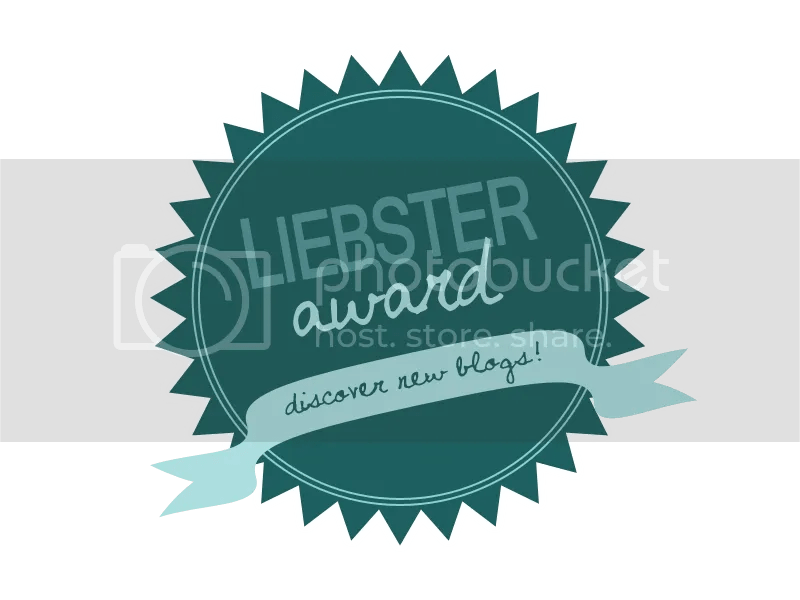 I looked tonight and realized I needed to do a blog update because I had missed so many results postings. Some of the awards have been given without naming the scores for everyone, so I don’t know my scores in some cases. No medals so far though, and I have been scoring pretty low when it has been listed. A lot of competition out there though! 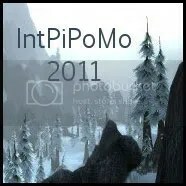 So here are my pictures from the new categories posted- hope you like them! I was going for a black and gold look. 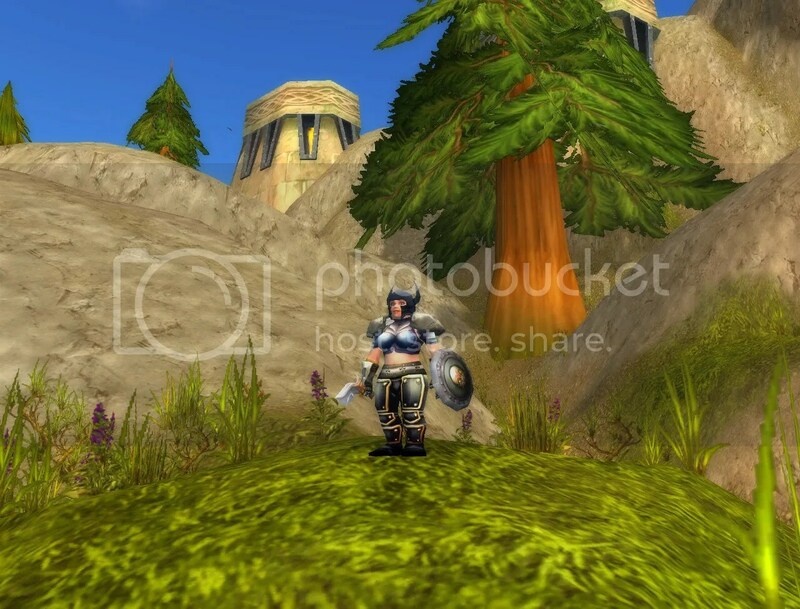 The items used were: Mugthol’s Helm, Field Plate Pauldrons, Hydralick Armor, Glorious Bindings, Stonegrip Gauntlets, Alabaster Plate Girdle, Golem Shard Leggings, Obsidian Greaves, Serpent Slicer, and Blackskull Shield. This is the first outfit I did. I put it together really quickly, and I love how it turned out. I wish I had made the screenshot somewhere different… Here are the pieces: Renouncer’s Cowl, Burden of Lost Humanity, Defender Tunic, Southfury Gauntlets, Belt of Shattered Elementium, Sundered Legguards, Tsunami Boots, Hammer of Sparks, and Goblet of Anger (not shown). On this outfit I was going for a natural look. Some of these pieces are no longer available in game…. The pieces are: Cormorant Helm, Blessed Pauldrons of Undead Slaying, Myrmidon’s Breastplate, Eradicator’s Bracers, Thornsnarl Gauntlets, Southfury Belt, Blessed Greaves of Undead Slaying, Amberpine Greaves, Massive Battle Axe, and Vishanka, Jaws of the Earth. 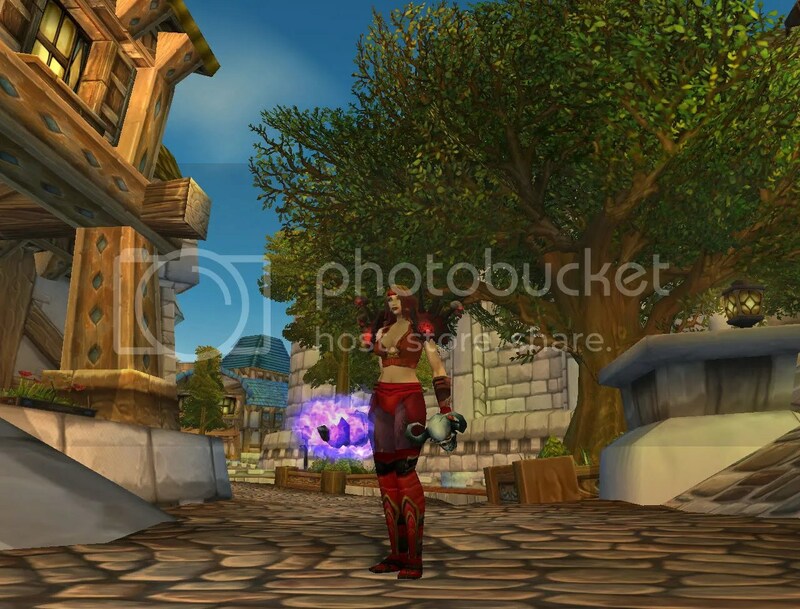 This is a red and black outfit for plate wearer on a nightelf DK. 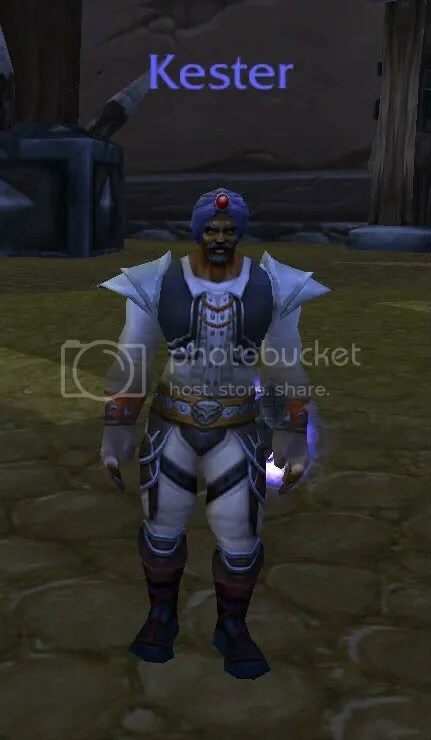 It includes- Greathelm of the Titan Protectorate, Rescuers Shoulderguards, Illidari Cloak…, Demon Forged Breastplate, Warlord’s Iron-Gauntlets, Forgemaster’s Shattered Shackle, Legguards of the Shattered Hand, Warlord’s Sabatons, and Hellreaver. 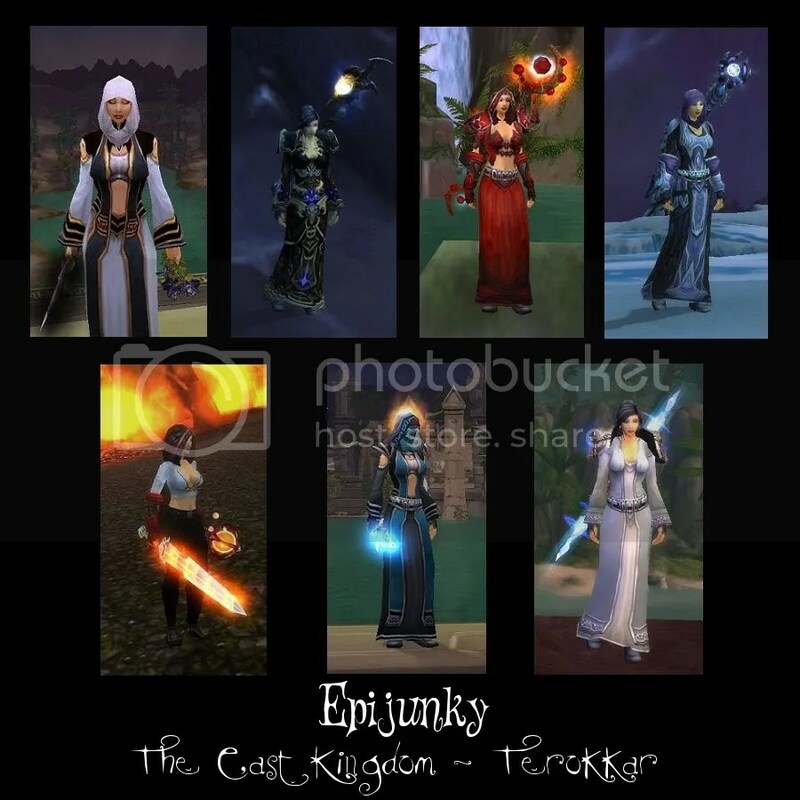 You can see from the gear lists that Epi uses some of the same items for multiple outfits (example: black mageweave gloves). It is good to have some basic pieces of gear in your wardrobe that will match anything. 1) I don’t wear something if I see anyone else on the server wearing it. 2) I usually go for mixed sets as opposed to tier sets. That being said, it is inevitable that I pick up lots of green gear while leveling our mass amount of alts. 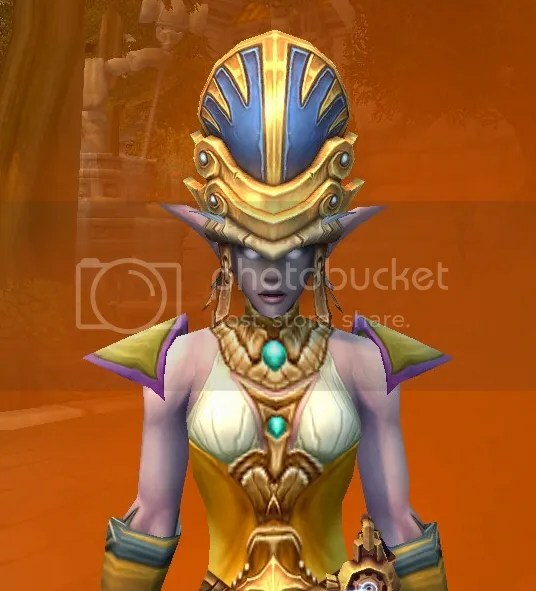 So I noticed the other day that my shaman star (you will soon see her Olympics Wrestling outfit) had several pieces of the Battleforge set in her bank. 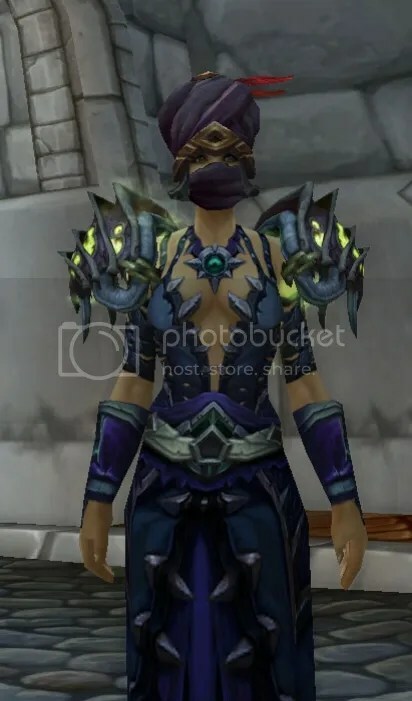 While I love the Battleforge set, almost every hunter at least on the server wears it. First I ctrl clicked it, then I put it on, and I was hooked. I don’t even have the whole set, but man it looks good on my dranei. In my previous spring party post, I did not mention the outfits I wore…so here they are! If you don’t have the Spire weapon, you could substitute the Dreamseeker Dandelion offhand. 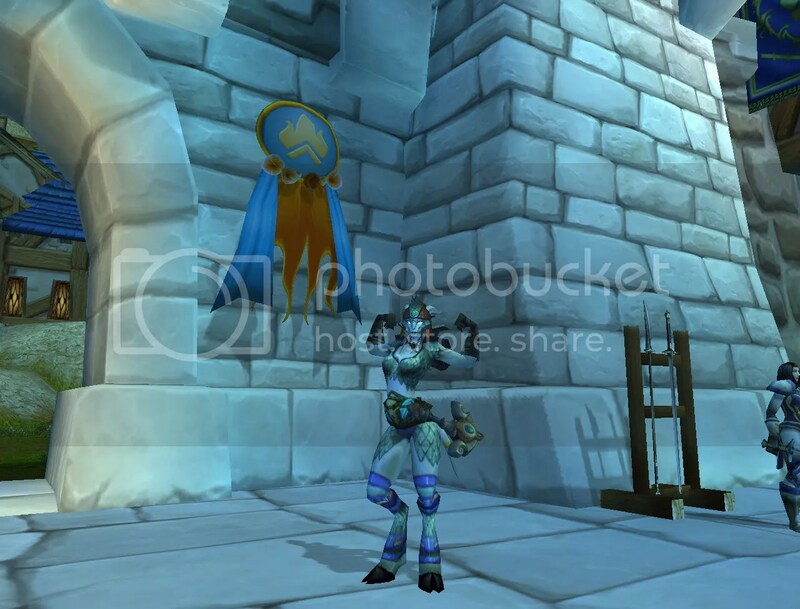 Then there is Druid Gaga, our guild mascot. Her spring party outfit used yet another stand-out helm- this time Stylin’ Purple Hat. 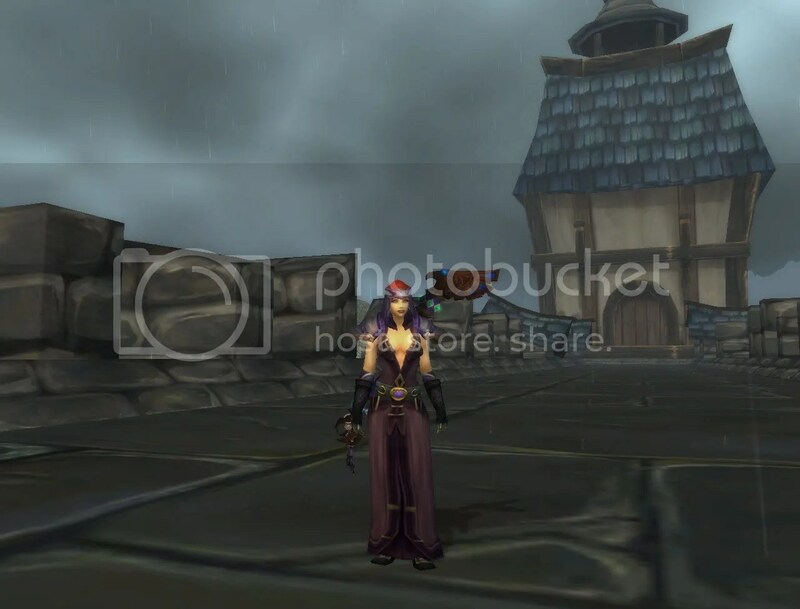 As promised, here are more warlock transmogs…starring my main, Chatmay! 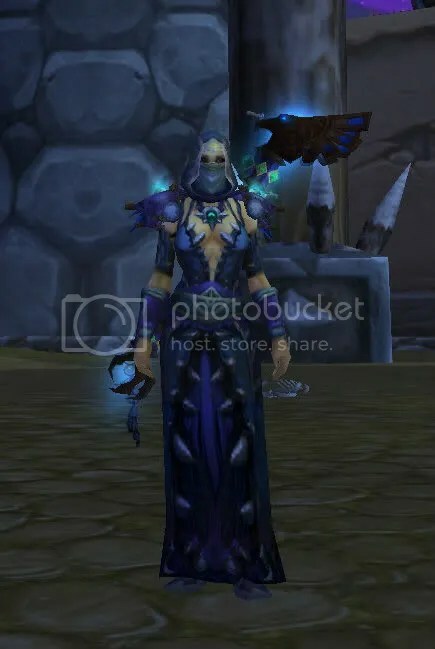 I tried to make each outfit have at least one warlock piece in it. 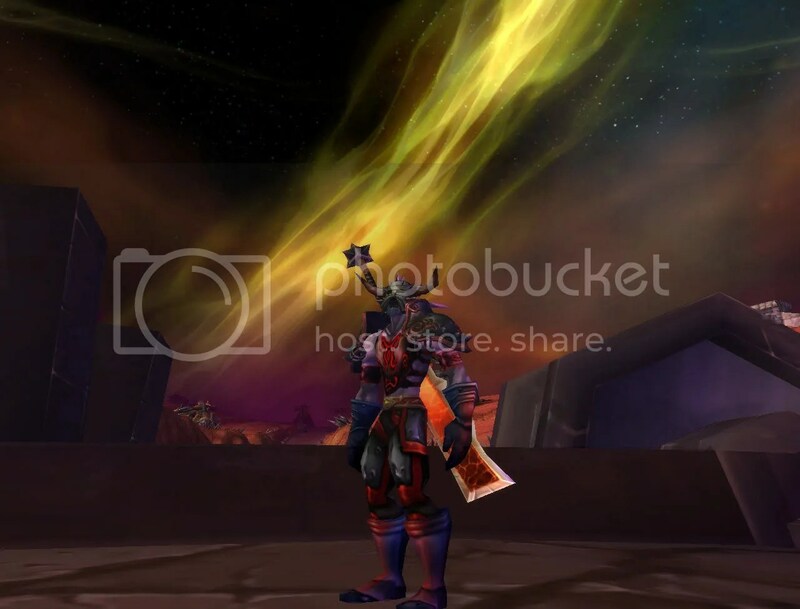 Pictured outside Naxxaramus in Dragonblight, this is the Valorous Plagueheart Circlet and Valorous Plagueheart Shoulderpads with Meteor Chaser’s Raiment, Ebony Flame Gloves, and the warlock quest item, Staff of Justified Sins. This outfit just requires a lot of farming- the Felheart Tier set. Chat is shown in this picture without the belt (more slimming), and I do not have the gloves- using Gossamer Gloves. 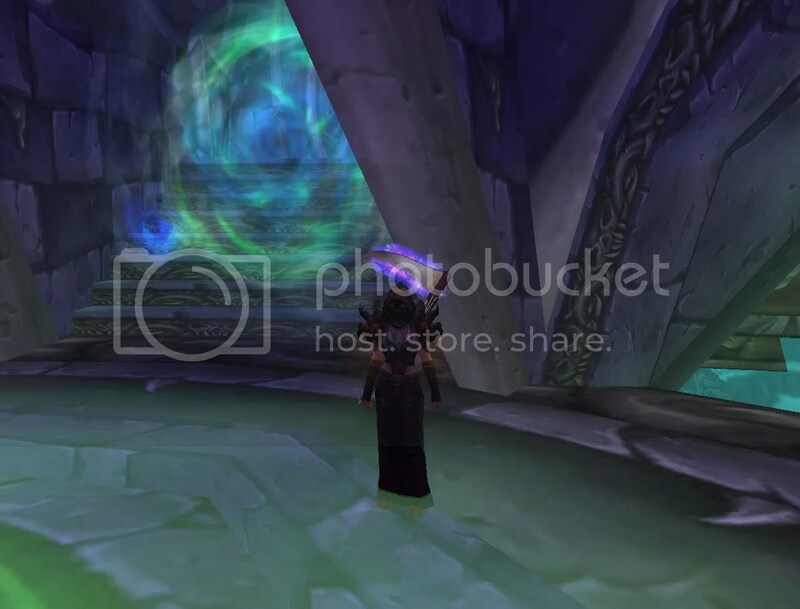 The staff is another Naxx piece, Sulfur Stave, but it is the same model as a staff from vanilla. This outfit centers around Merciless Gladiator’s Dreadweave Mantle. 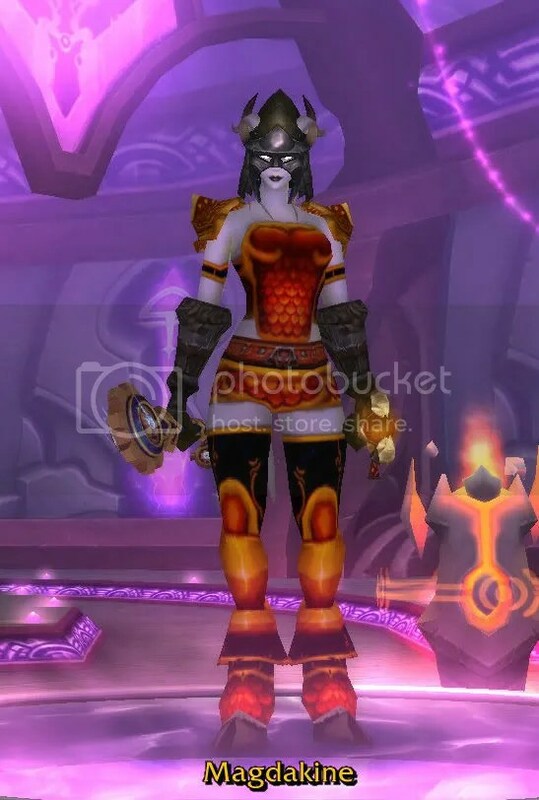 I used a lot of different pieces here: Red Mageweave Headband, Crimson Silk Vest, Infernoweave Gloves and Boots, Leggings of Ancient Magics, Captain Sanders’ Sash, Incineratus, and Swampchill Fetish. 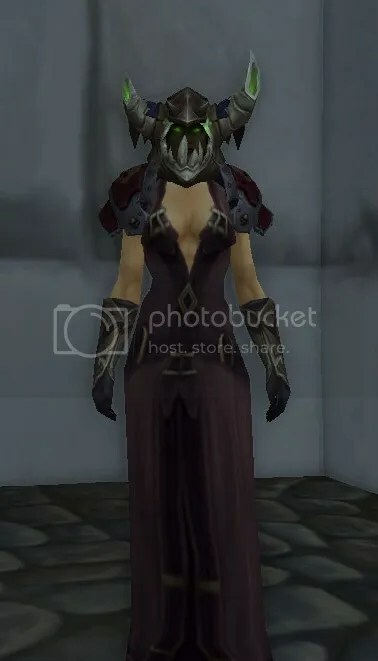 Using Dreadweave Hood and Conqueror’s Deathbringer Gloves, this is a black look with Vicious Fireweave Shoulders, Thistlefur Robe, Bands of the Benevolent, Runecloth Belt, Kilix’s Silk Slippers, and Origin of Nightmares. I think I am going to use the 3rd outfit for a while now. Hope you like these! 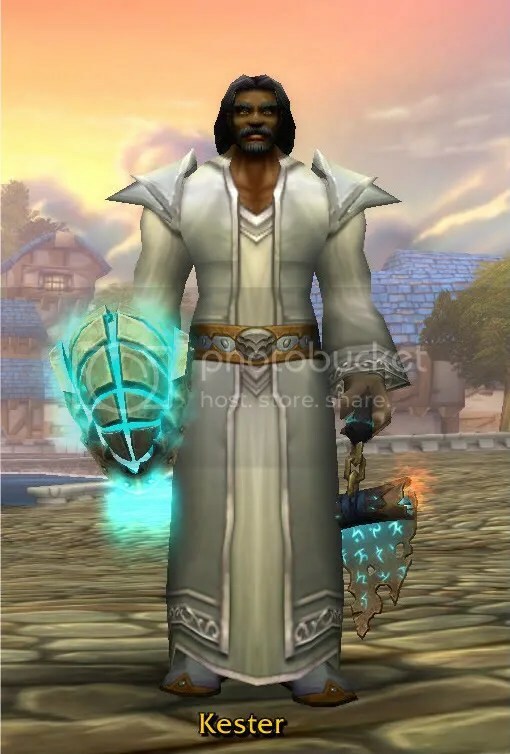 You would think all I do is play my priest, Meridia, as many priest transmog articles as I have written! I just have more outfits! 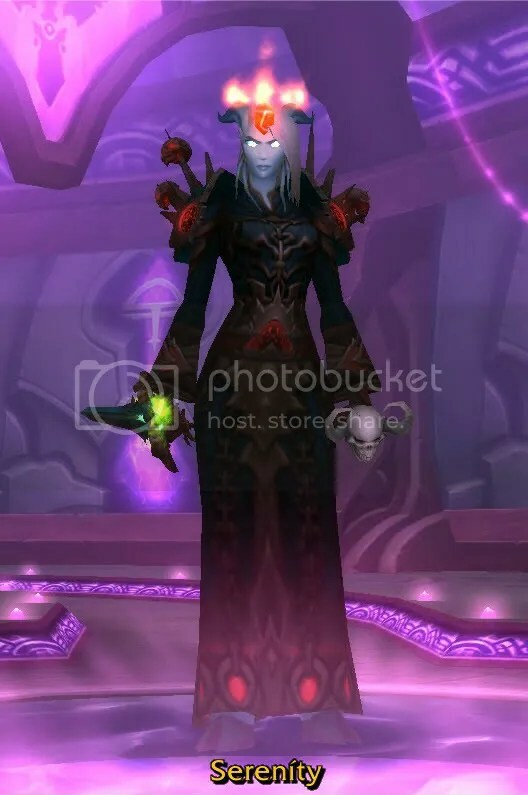 If you have read my previous posts about priests, this outfit kind of combines different pieces from each set I have done in the past. I am trying to look all baddy here lol. Kester has always been dear to my husband’s heart. He is an upper-class, elegant, charming kind of priest. My husband wanted a traditional, religious look for him. 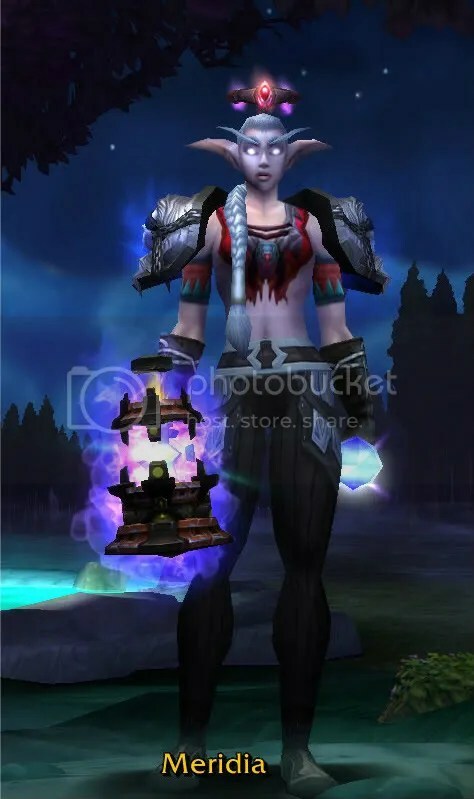 Note: as far as I know the weapon and offhand have not been transmogged yet, but these items kind of go with the white. Hope you enjoyed these, and feel free to critique them! 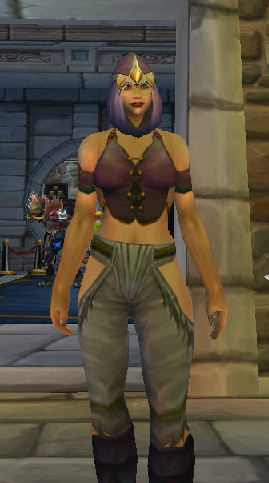 Also, don’t give up hope… I plan to start transmogging my lock again soon and show you some of her goodies.